Experts believe that production of the the Sukhoi Superjet will move ahead – not least because there is no real alternative. The crash of a Sukhoi Superjet 100 in Indonesia on May 9 has revived the discussion over the future of Russian civil aviation, but experts tend to think that the project, known as SSJ-100 for short, will go ahead regardless of the causes of the crash. The experts’ predictions are bolstered by the fact that no official documents on suspension of SSJ-100 contracts have been filed by customers. Indonesia is the biggest foreign buyer of the Superjet, and so far reports that the country’s government has recommended that local buyers suspend their contracts have not been confirmed. Jet crash caused by human error? The terrain in the area where the plane went down has made the recover of wreckage difficult, but one flight recorder has been found, and it may shed some light on the causes of the disaster. So far, however, the decoding of the conversations between the crewmembers in the cockpit has not revealed any failures or technical malfunctions. According to a joint statement by the Republic of Indonesia National Transportation Safety Committee and the Russian Industry Ministry, which are investigating the plane crash, the landing approach systems were functioning properly. The United Aircraft Corporation, which owns the Superjet’s manufacturer, Sukhoi Civil Aircraft, admits that a tragedy like this is a colossal blow to any manufacturer’s reputation. However, so far there has been no change in the company’s plan to fulfill existing contracts for the plane. “It only makes sense to talk about the success or failure of a project after a prolonged period of commercial operation of the plane, when it will be possible to judge how reliable, safe and economical it is for the clients,” said Sukhoi’s press service, adding that the Superjet’s safety record is among the best in its class. 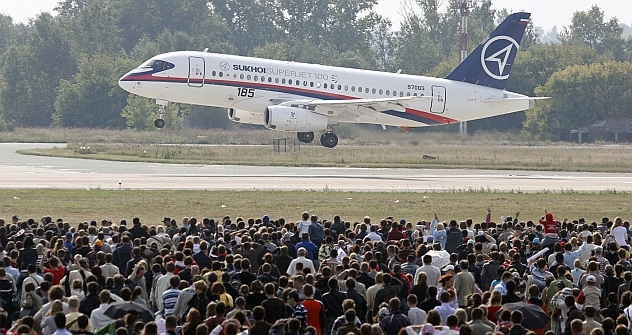 The Sukhoi Superjet 100 can carry 98 passengers and has a range of a little over 3,000 km (1,800 miles) for the standard version and 4,500 km (2,800 miles) for the long-range version. The SSJ-100 took its maiden flight on May 19, 2008. The catalogue price of the standard version is $35.4 million; the long-range version cost $36.2 million. Sukhoi Civil Aircraft currently has 168 confirmed orders for the plane. In addition to 42 planes for Indonesian airlines, the biggest foreign customers are Pearl Aircraft Corporation (registered in Bermuda, with its head office in Colorado), Interjet (Mexico) and Blue Panorama Airlines (Italy). Four Russian companies – Aeroflot, UTair, Gazporomavia and Yakutia have ordered a total of 66 planes. The first commercial operators of the SSJ-100 were the Armenian company Armavia and Russian national carrier Aeroflot. Aeroflot began commercial flights of the plane in June 2011 and is currently operating eight Superjets. During this period, the carriers have not filed any complaints about the plane’s performance and no significant technical incidents have occurred. Russian aviation experts are convinced that whatever the outcome of the investigation, the SSJ project will go ahead. During the 10 years since the political decision to revive aircraft building in Russia, the state has invested tens of billions of rubles in civil aircraft manufacturing. The SSJ project is the first attempt by the post-Soviet aviation industry to create a new plane “from scratch” – from the design stage to serial production. Additionally, aviation experts consider the medium-range market the only place Russia can find a niche in the global aircraft industry. The long-range segment of the market is dominated by the Boeing 737 and the Airbus A320, but neither Boeing nor Airbus is represented in the short-haul market. That segment is divided between the E-Jet family made by the Brazilian company Embraer, the CRJ series of the Canadian Bombardier company , the new Chinese ARJ21 planes and the MRJ project being developed by Mitsubishi of Japan. The future of the SSJ-100 will be decided in this motley company. Today all Russian civil aircraft projects involve broad international cooperation. The SSJ-100 is being built in close cooperation with designers from more than 20 leading aircraft builders. Alenia Aeronautica, part of the Italian engineering concern Finmeccanica, owns 25 percent plus one share of Sukhoi Civil Aircraft. It has also set up a joint venture with Sukhoi Holding called SuperJet International to promote and sell the SSJ in the world market and to customize the plane and provide after-sale and maintenance services across the world. The main systems for SSJ planes are supplied by leading foreign aircraft-building companies. Its SaM146 engine is being designed and built by PowerJet, a joint venture of the French company Snecma and Russia’s NPO Saturn. Boeing provides consultancy support for Sukhoi Civil Aircraft in the field of design and production, marketing, certification and quality assurance at the enterprise, work with system suppliers and after-sale support. Another major reason why the SSJ project will not be curtailed is the industry’s investments in the service infrastructure for this plane. One of the main challenges aircraft builders face is training pilots who can make commercial flights on a new type of aircraft. A training center for the Sukhoi Superjet 100 has opened in Zhukovsky, outside Moscow. SuperJet International trains air and ground crews there while Sukhoi Civil Aircraft ensures the functioning of all the training equipment and simulators. The center has computer instruction systems, simulators of the instrument panel and controls, and a stationary simulator. The most impressive machine is the Full Flight Simulator, which simulates normal, complicated and emergency flying conditions in real time at all stages of the flight in any weather and at any time of day. A Sukhoi representative says all pilots are initially trained at state facilities under the Federal Air Transport Agency (Rosaviatsia), while candidates for training on the SSJ-100 are chosen by the carriers. From spring to November 2011 19 crews (38 pilots) were trained at Zhukovsky – 16 crews for Aeroflot and three for Armavia. Between December 2011 and early May 2012, 54 Aeroflot pilots were retrained with the use of the full flight simulator. The simulator training was followed with a test flight on a real plane. Forty-four of the pilots had no previous experience piloting planes with a glass cockpit, a control element not used on Russian-made planes before the SSJ-100. Meanwhile the hi-tech world is not standing still. Russia’s ambitions in the field of aircraft building include some cutting-edge developments. Design has started on a long-haul plane called the MS-21, which is expected to compete in the same class as the Boeing-737 and the Airbus 320. The plane’s first flight is due to take place in 2018. The industry also hopes to create a second regional plane within the next 10 years. In May, the Ministry of Industry and Trade held a tender for the development of a next-generation inter-regional passenger airliner. The government plans for the new plane, drawing on the developments for the SSJ-100 and the MS-21, will carry up to 130 passengers over distances of between 3,280 km (2,000 miles) and 5,300 km (3,300 miles) and will have operational costs at least 5 percent less than the foreign equivalents currently being designed. The price of the contract is 2.576 billion rubles ($78.5 million). The Ministry of Industry and Trade considers the project a priority of civil aviation building, since the world market demand for this class of plane is expected to reach 5,000 aircraft by 2029. The Ministry of Industry and Trade plans for Russian aviation manufacturers to control 10 percent of the world aircraft-building market by 2025. This seems like a herculean task given that currently Russia holds only about 1 percent of the market. And yet, in the late 1980s, the Soviet Union produced about a quarter of the world’s civilian planes. Aleksey Ekimovsky is the author for market guide “Russian Transport”.